I don’t want to live in a tiny house. There, I’ve said it. Perhaps if I had remained unwed and lived alone I would feel differently, though I suspect not. I respect minimalism, but have no desire to live in such a small space with my possessions pared down to the bare minimum. Yet, this isn’t to say that I don’t like tiny houses, because that wouldn’t be true either. In fact, despite my desire to make my residence in roomier accommodations, I love tiny houses. 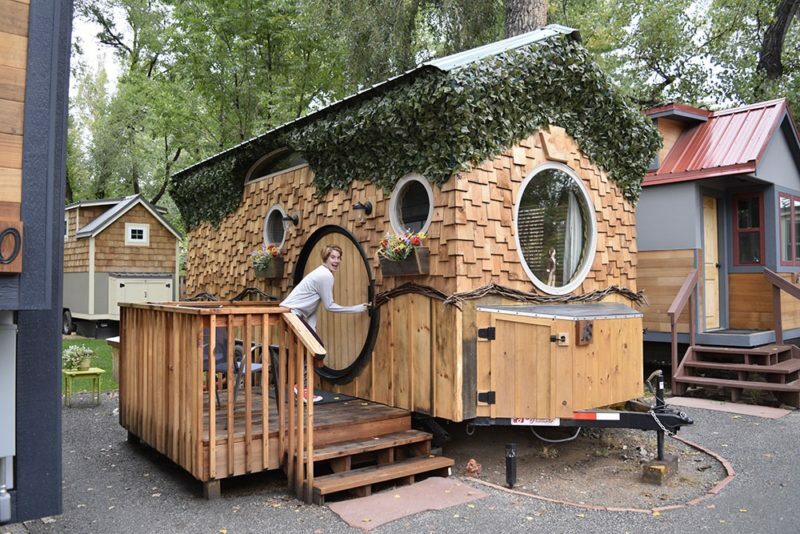 I don’t want to live here, but that doesn’t mean I don’t love this tiny house! I love the designs, the mobility, the architectural design tricks used to maximize storage and living space while reducing clutter. 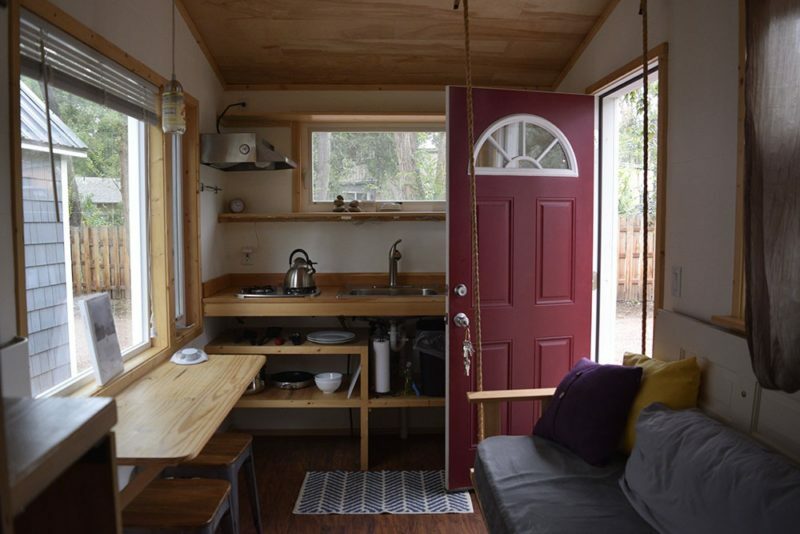 So when I come upon one, which isn’t often in my part of the Midwest, I tend to nose around as much as possible, and soak in as much of the tiny house aesthetic as I can. 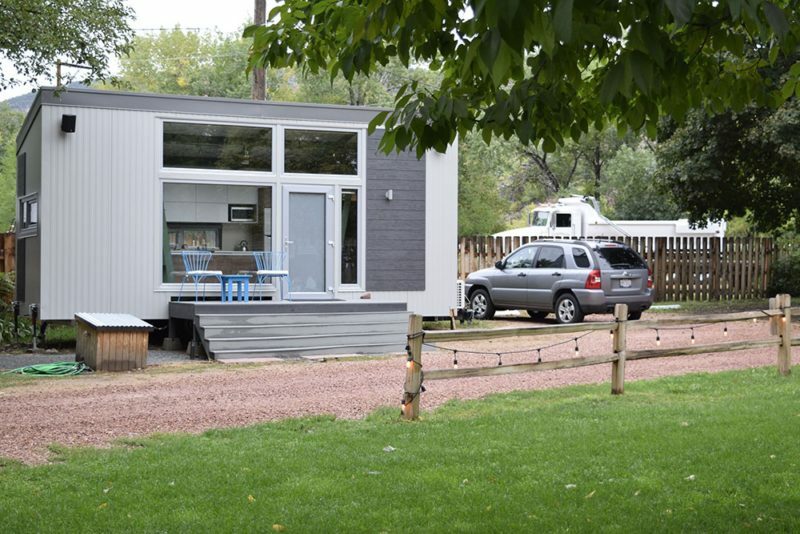 Because I love tiny houses, excitement reigned when Clarissa and I had the opportunity to collaborate with WeeCasa, the world’s largest tiny house resort, located in Lyons, Colorado. 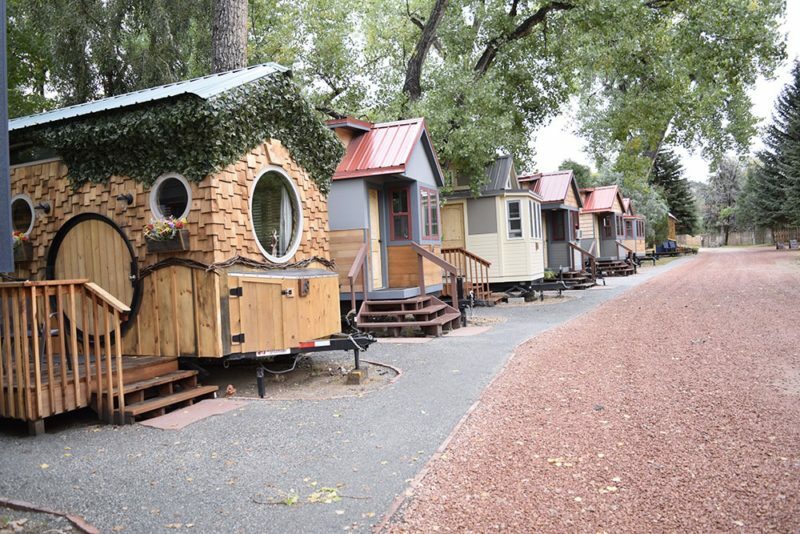 A row of tiny houses at WeeCasa. Tucked away off of W. Main Street, WeeCasa always felt far away from the rest of the world during our stay. Sure, we occasionally heard a vehicle driving by, or noticed evidence of the town over the fence, but it never seemed to encroach upon the resort. Yet despite feeling like its own neighborhood, WeeCasa sits close enough to local restaurants and bars that you’ll feel welcome in the community at large. WeeCasa makes a great base of operation if you plan on making day trips into Rocky Mountain National Park, which is exactly what we did. A thirty minute drive will take you to Estes Park, and an additional ten minutes will get you into Rocky. 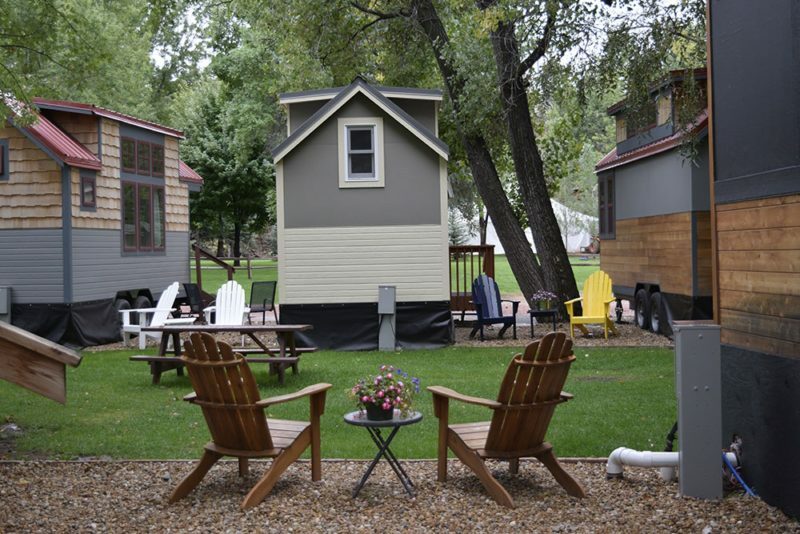 What’s a Tiny House Resort? Steelhaus, our tiny home away from home for a few nights. Meanwhile the Hobbit House’s creator envisioned a much different aesthetic. This one was Clarissa’s favorite. As we walked along the road looping through the resort, we kept pointing to different houses, exclaiming how we would love to stay in one or the other, that we loved the appearance, or some feature caught our eye. If variety truly is the spice of life, you can count on WeeCasa to spice things up! I think the Pequod was my favorite! I just loved the boat-like aesthetic! We stayed in the sleek and modern Steelhaus, situated right at the front of the property. It’s not what you might envision when someone says “tiny house,” but we enjoyed living here for a few days. Despite being a tiny house, overall we felt that it was quite spacious; the all-glass front filled the house with natural light, even when clouds covered the sky, making the space feel expansive. Once the sun set and we wanted privacy, we just lowered the screens. Boom! Instant protection from prying eyes. We enjoyed keeping it open before the sun set. We both love natural light. The kitchen in Steelhaus actually boasts more room and counter space than our kitchen back home, as well as modern appliances, and all the cookware you’ll need for simple meals. There’s a comfortable sitting area off of the kitchen, with plenty of legroom, a lovely LED fireplace/heater, and a nice flatscreen in case you want to hook up your Chromecast, Apple TV, or Amazon Firestick. Clarissa loved warming up in that spot with a little hot cocoa. The couch is very comfortable, and folds out into an additional sleeping area if you’ve got a full house. In theory two people can sleep in each of the two sleeping lofts, but there’s a bit of an art to sleeping in some of these loft spaces. In Steelhaus, the lofts are pretty close to the ceiling; if I had sat up, I would have bumped my noggin! If you move around in your sleep like I do, then you may need a more spacious loft (which many of the other houses have), or different sleeping arrangements. On our second night at WeeCasa, we opted to fold out the couch and sleep on the ground floor instead of in the loft. A wonderful night’s sleep graced all inhabitants of Steelhaus that evening. I know more about Steelhaus because we stayed there, but we did get a lovely tour of WeeCasa, and had the pleasure of entering a few of the other houses. No two are the same, but they are all alike in their quality. You can check out all of the houses on their website prior to making a reservation to help you decide which tiny accommodation is right for you. 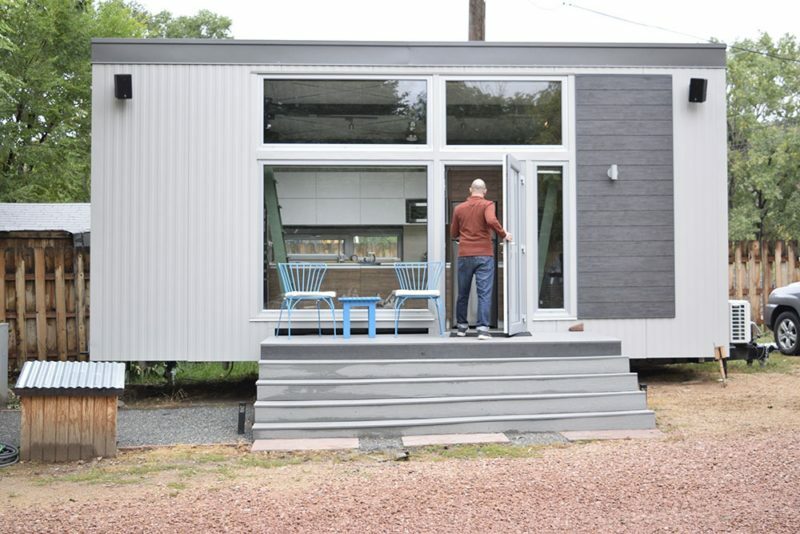 Whatever your tastes, you’ll find a tiny house that suits you at WeeCasa. I loved staying at WeeCasa! It’s a beautiful place, with beautiful tiny houses, and plenty of great restaurants and bars nearby. That said, tiny house living, even for a few nights, does have some downsides. Big or tall? I already mentioned the challenge of the Steelhaus sleeping loft. Keep that in mind as you decide which house you’d like to stay in. The showers are pretty compact as well, so be prepared for a tight squeeze. Speaking of showering; like the houses, the water heaters are pretty small, so don’t plan on being in for too long. Clarissa and I were both able to take showers, but the water was starting to get pretty cool by the end of mine. I recommend alternating bathing; one shower in the morning, the other at night. Honestly, that’s about it as far as negatives go. The folks at WeeCasa did a fantastic job ensuring that our experience was a positive one, and from what I observed, that’s just how they do business. Seriously, if you like tiny houses, you’re going to enjoy your stay here. The expense is comparable to nice hotel room; sure you get less space, but the overall experience far exceeded most of my hotel stays. The house was immaculate, and since we shared no walls with other guests, we had tons of privacy. 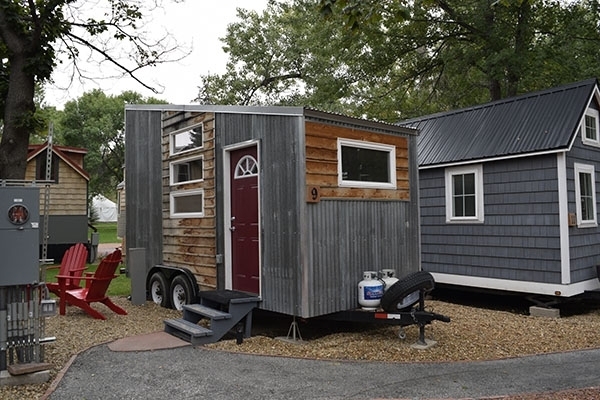 Think you’d like to give tiny house living a try, even if only for a night or two? Do it! The nightly rates vary from around $140 to $300 depending on what days of the week you stay and which tiny house you’d like to stay in. Some book up pretty far in advance, so plan ahead if you have preference. Also, be aware that a 2-night minimum is required on Fridays and Saturdays starting in April, and any day of the week in June, July, and August. Every house has a kitchenette with a mini-fridge, cooktop, cookware, dishes, and silverware. You won’t be able to cook Thanksgiving dinner here, but you’ll be all set to cook simple meals. You’ll also find a french press and coffee for your caffeine needs, as well as everything you’ll need to clean up after you’re done eating and drinking. 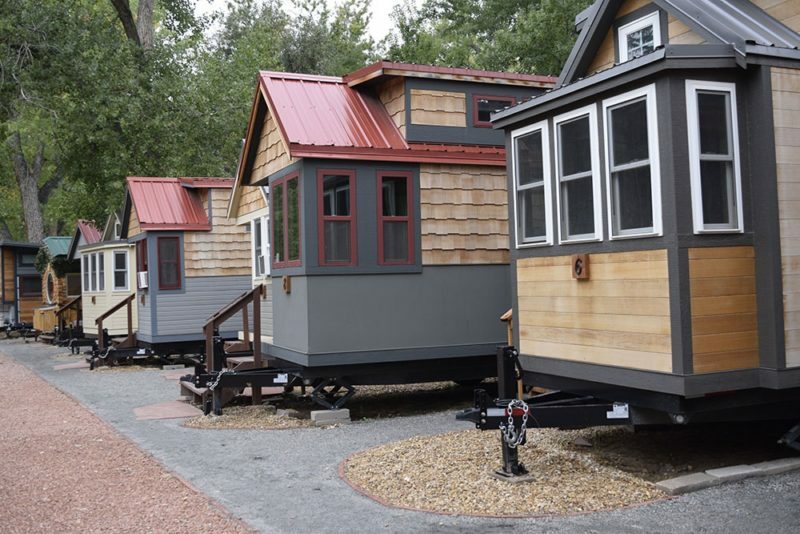 It is worth noting that some of the tiny houses do not have air conditioning; those that lack this amenity will have fans available for your cooling needs. Many of the houses do, however, have air conditioning, so if that’s a necessity for you, they’ll have you covered. You’ll also find just about everything you’d find in a traditional hotel room; toiletries, bath towels, extra pillows, and free WiFi. 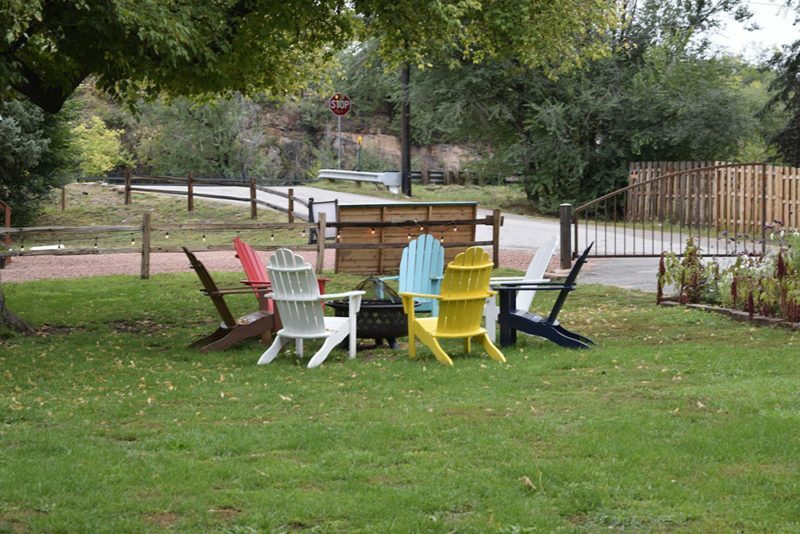 There are charcoal grills, picnic tables, and fire pits available on the property, as well as lots of cool common areas where you can sit and relax, or get to know other guests if you so choose. This looks like a nice place to sit by the fire and chat with other WeeCasa guests. Clarissa and I both loved our stay at WeeCasa; it provided a perfect base of operations for this leg of our journey, in both a lovely and comfortable fashion. 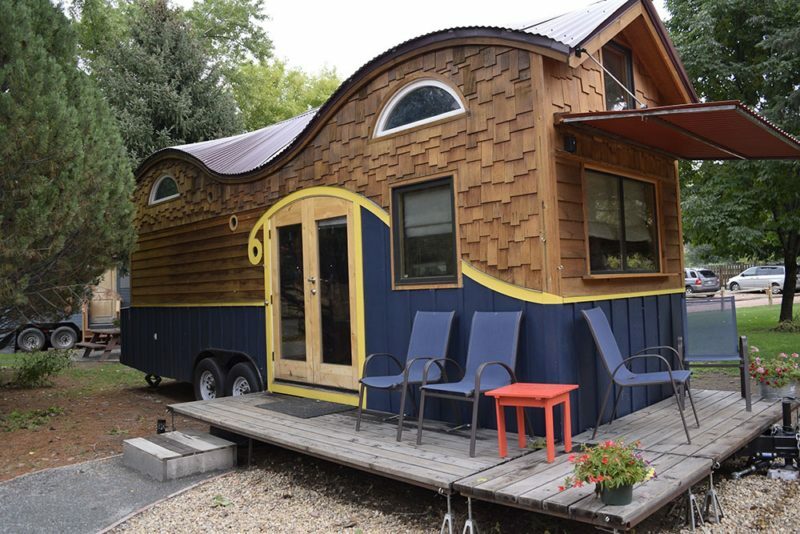 If you’ve had any interest in tiny houses and plan on venturing to Lyons, Colorado, I recommend that you stay at WeeCasa; you’ll feel like you’re living large, no matter how small your house is! Note: WeeCasa provided us with a two-night stay as part of a social media collaboration.